Lookup transformation is responsible to join columns to the data flow/data set, by accessing additional information in a related table based on values in common columns. Problem : We have a table EMP which data are fetching by OLEDB Source, this table contains column FName, LName, Salary and Country. 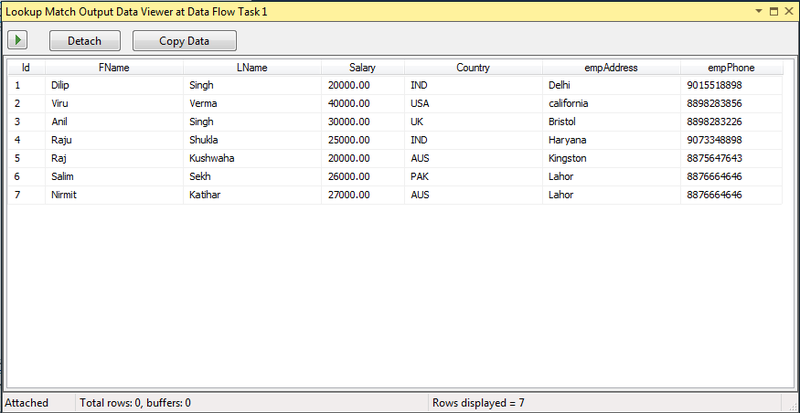 In the flow we need to add column empAddress and empPhone of Employees which information are in EMPDETAILS table. Solution : We would use Lookup Transformation. 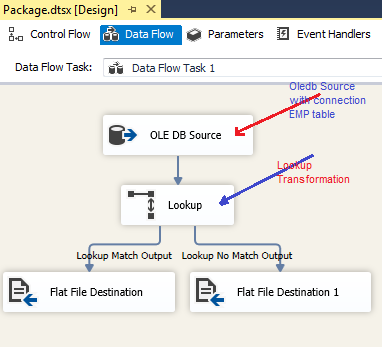 Now see below the use of lookup transformation..
First drag and drop an OLEDB Source and make connection manager then select EMP table (I hope you know about OLEDB Source) . In data set you will find only columns like FName, LName, Salary, Country now we have requirement additional information like Address and Phone which belongs to EMPDETAILS table. Now we will use Lookup Transformation to add or join column from EMPDETAILS table on the basis of common column, In EMPDETAILS table empId is the foreign key of EMP it means empId is common between EMP and EMPDETAILS on this basis we can perform Lookup Transformation. 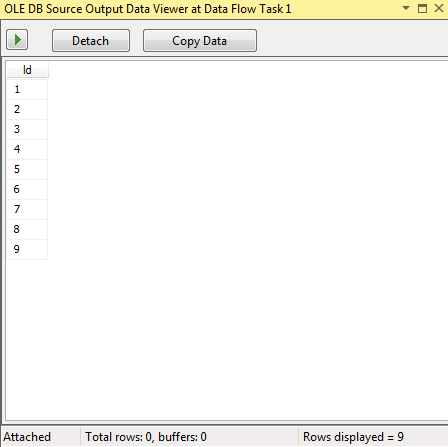 Drag and drop Lookup Transformation and add flow path from Oledb Source and edit it. It will look like below . Full cache: Full Cache is responsible to generate and load the reference dataset into cache before the Lookup transformation is executed. Partial cache: Partial Cache is responsible to generate the reference dataset during the execution of the Lookup transformation. Load the rows with matching entries in the reference dataset and the rows with no matching entries in the dataset into cache. No cache: No cache is responsible to generate the reference dataset during the execution of the Lookup transformation. No data is loaded into cache. 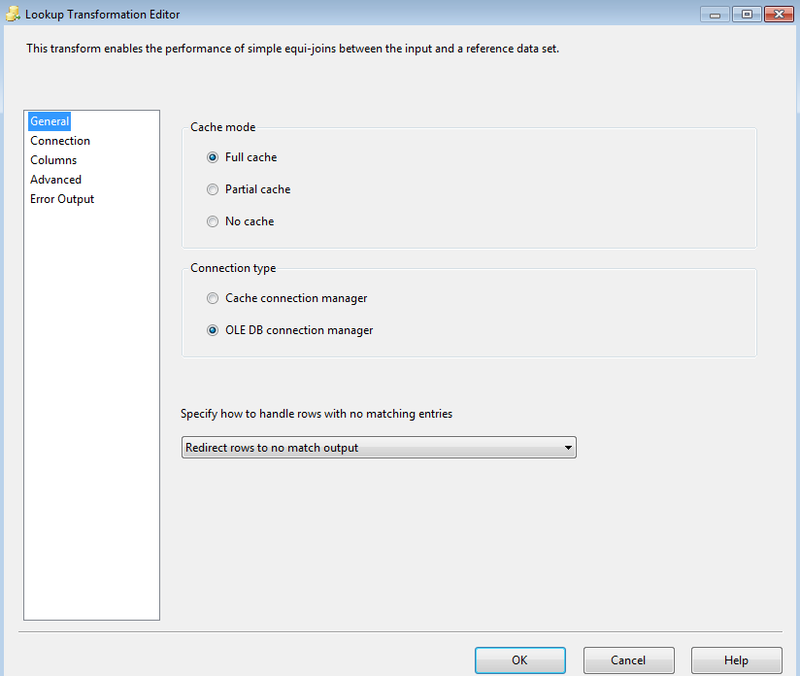 Cache connection manager: Cache connection manager is responsible to configure the Lookup transformation to use a Cache connection manager. This option is available only if the Full cache option is selected. 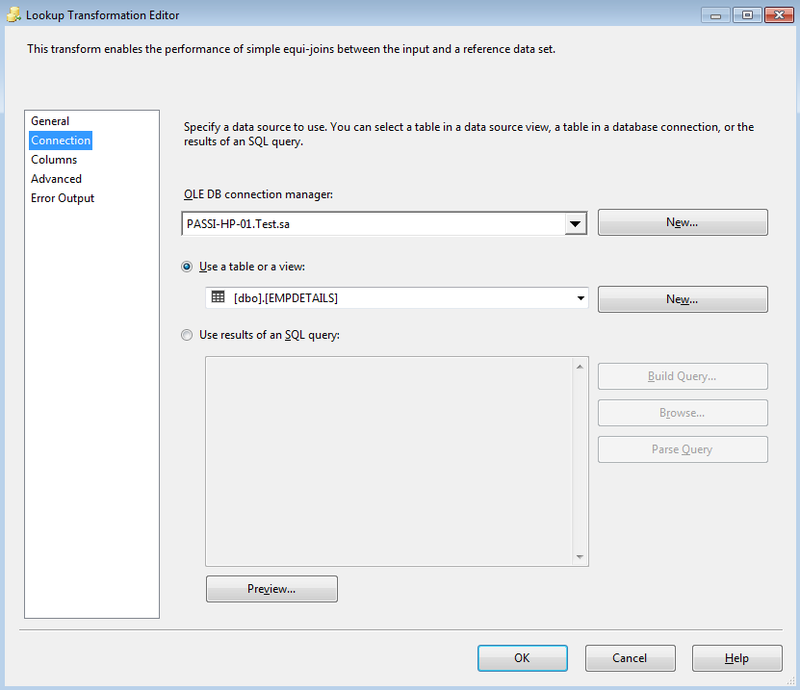 OLE DB connection manager: OLEDB connection manager is responsible to configure the Lookup transformation to use an OLE DB connection manager. Select an option for handling rows that do not match at least one entry in the reference data set. OLE DB connection manager: Here you can select an existing OLE DB connection manager from the list, or create a new connection by clicking New. Use a table or view : Here you can select table from the list or you can create new table or view on by clicking New. Use Result of an SQL Query: By choosing this option you can browse to a pre-existing query, build a new query check query syntax and preview query result. 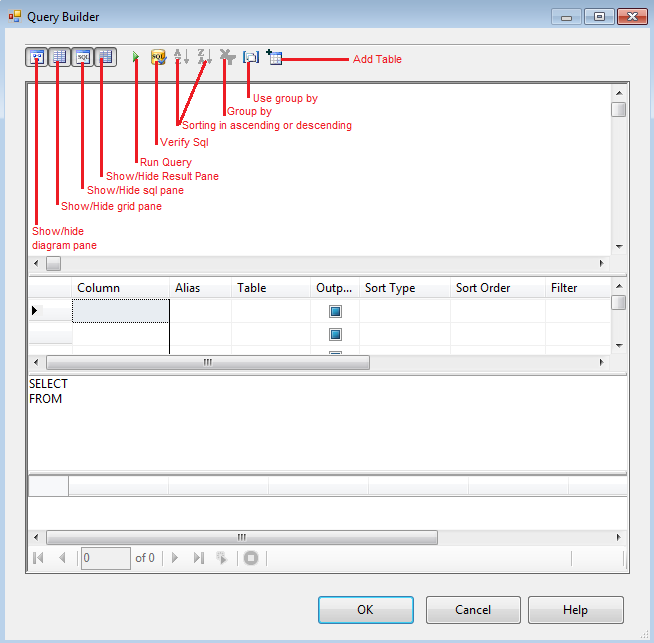 Build Query: Create the Transact-SQL statement to run by using Query Builder, a graphical tool that is used to create queries by browsing through data. It look like below. Browse Query: Using this option you can browse pre-existing query. Preview: This is responsible to preview query result. Available Inputs Column: This columns are come through data flow from a connection source. The input columns and lookup column must have matching data types. 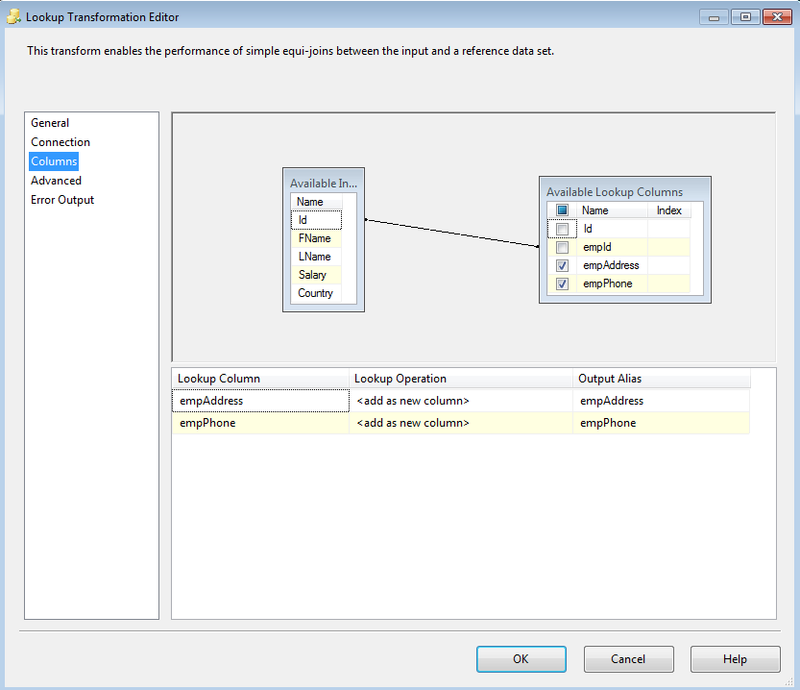 Use a drag-and-drop operation to map available input columns to lookup columns. You can also map input columns to lookup columns using the keyboard, by highlighting a column in the Available Input Columns table, pressing the Application key, and then clicking Edit Mappings. Available Lookup Columns: The lookup columns are those columns comes through reference table in which you want to lookup values that match the input column. Use a drag-and-drop operation to map available input columns to lookup columns. Use the check boxes to select lookup columns in the reference table on which to perform lookup operations. Lookup Column: These columns comes when you select column from available lookup columns. The selections are reflected in the check box selections in the Available Lookup Columns table. Lookup Operation: Select option to perform operation on lookup column. Output Alias: The selections are reflected in the check box selections in the Available Lookup Columns table. Note: This option available only for Partial and no cache. Cache size (32-bit): Adjust the cache size (in megabytes) for 32-bit computers. The default value is 5 megabytes. Cache size (64-bit): Adjust the cache size (in megabytes) for 64-bit computers. The default value is 5 megabytes. 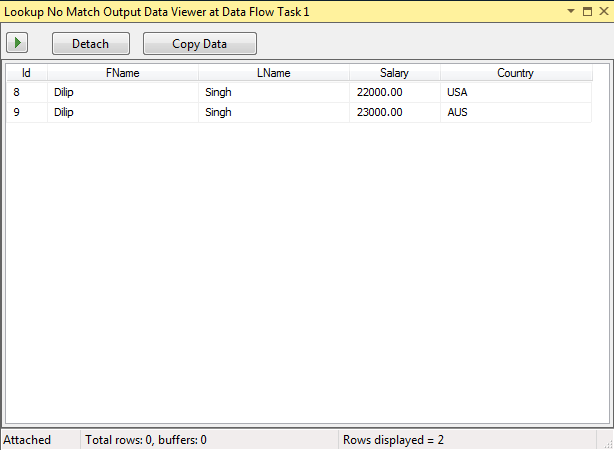 Enable cache for rows with no matching entries: Cache rows with no matching entries in the reference dataset. Allocation from cache: Specify the percentage of the cache to allocate for rows with no matching entries in the reference dataset. 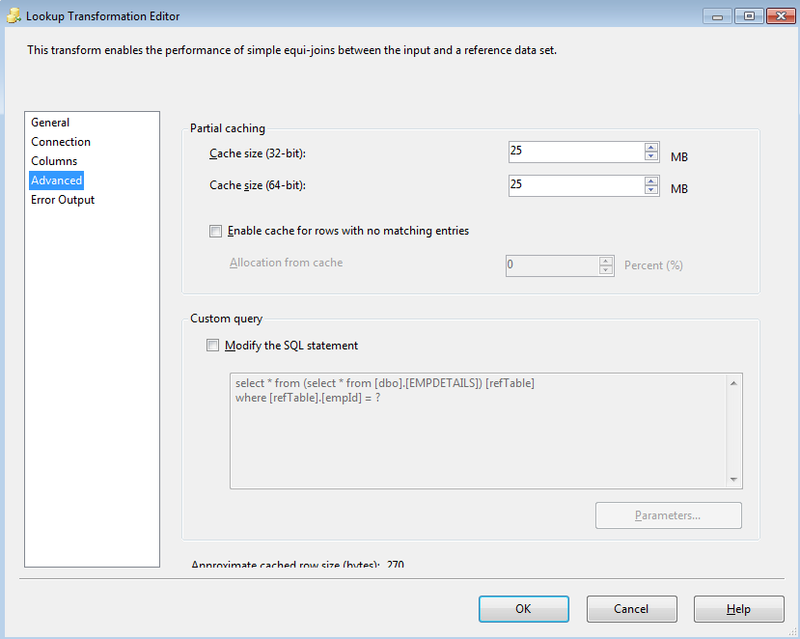 Modify the SQL statement: Modify the SQL statement that is used to generate the reference dataset. Error and Output : I will explain it latter in Error Handling..
Now I am starting output explanation.. Please apply Data viewers on every path, input data looks like below. Here only on column match with column in reference table. for example id of EMP(input table) is matched with empId in EMPDETAILS(reference table). Here show matched output data, you can see empAddress and empPhone columns are join in dataset. like this you can see not matched data as given below..